On 12 July 2014, the feast day of the Holy Glorious and All-Praised Chief Apostles, Peter and Paul, Metropolitan Hilarion of Volokolamsk, chairman of the Moscow Patriarchate’s Department for External Church Relations, officiated at the Divine Liturgy at the Representation of the Serbian Orthodox Church, the Church of Ss. Peter and Paul on Yauza in Moscow. Concelebrating with him were Metropolitan Niphon of Philippopolis, representative of the Patriarch of Antioch and All the East to the Patriarch of Moscow and All Russia; Bishop Antonije of Moravica, representative of the Serbian Patriarchate to the Patriarch of Moscow and All Russia; Archimandrite Feoktist (Dimitrov), representative of the Bulgarian Patriarch to the Patriarch of Moscow and All Russia; Archimandrite Serafim (Shemyatovsky), representative of the Orthodox Church of the Czech Lands and Slovakia to the Patriarch of Moscow and All Russia; archpriest Nikolai Balashov, DECR vice-chairman; archpriest Igor Yakimchuk, DECR secretary for inter-Orthodox relations; and clerics of the church. H.E. Slavenko Terzić, Ambassador Extraordinary and Plenipotentiary of the Republic of Serbia to the Russian Federation, attended the festive service. 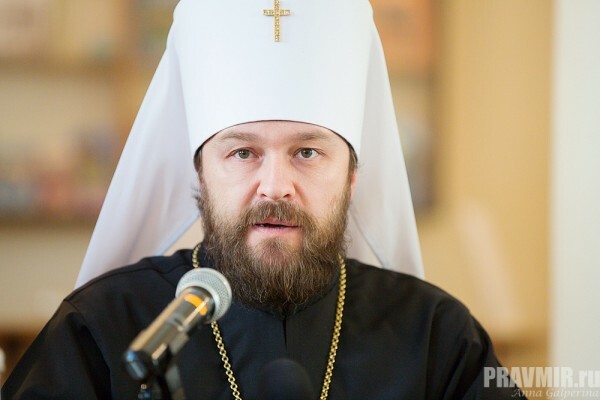 After the Litany of Fervent Supplication, Metropolitan Hilarion said a prayer for peace in Ukraine. After the Liturgy, Bishop Antonije of Moravica greeted Metropolitan Hilarion and all the worshippers and congratulated the representative of the Patriarch of Antioch to the Patriarch of Moscow and All Russia upon his elevation to the rank of metropolitan. “The feast day of Ss. Peter and Paul, is celebrated by of the whole Orthodox Church. It is not fortuitous that the feast is preceded by a period of fasting… By establishing the fasting period, the Church has honoured those who had been working with other apostles in order to continue on earth the mission of our Lord and Saviour Jesus Christ, those who had followed Christ and suffered the martyr’s death. According to the word of God, all apostles hold a special place in the Church. Yet, the Church and the Holy Fathers call only Peter and Paul Chief Apostles, because Peter is a solid rock in the foundation of the Church and Paul is a driving force; Peter preached Christ among the Jews, and Paul – among the gentiles. “Dear Bishop Antonije, we are happy to participate in this celebration on the day of the patronal feast of your Representation. You know that His Holiness Patriarch Kirill of Moscow and All Russia intends to visit the Serbian Orthodox Church after His Holiness Patriarch Irinej visited the Russian Orthodox Church. We are looking forward to this return visit. Let us prepare it together, so that we could, like St. John the Baptist who had made straight paths for the Lord (Cf. Mt 3:3), serve our Primates in their upcoming meeting.